Join Helsinki's first-ever Yoga and Vegan Festival at the popular sports hub, Unisport in Espoo. You can participate in Yoga and meditation sessions, treat your taste buds to some delicious plant-based foods, try henna body art, enjoy relaxing massages, attend talks on subjects of health and wellbeing (including mental health), and end the day with fun Bollywood dancing. There will also be free Yoga classes for children to make this a perfect family day out. Please see below to know the format of the festival. Language: All classes will be taught in English with key instructions translated by our volunteers of the teacher (if the teacher is Finnish). The only class taught in Finnish is Yin Yoga class with Annukka at 12ppm but our volunteers will translate key instructions in English. Pay per class: We are planning to schedule a variety of Yoga/meditation sessions at the festival across two halls: Room A and Room B. Yoga and meditation teachers from 4 countries (Netherlands, Ireland, India and the UK) are coming together to teach at the festival and give you an amazing Yogic experience. Each session will be 45-minutes-long. There is a capacity of 200 participants per session. A professional sound system and a stage will ensure that you can hear/see the teachers easily. 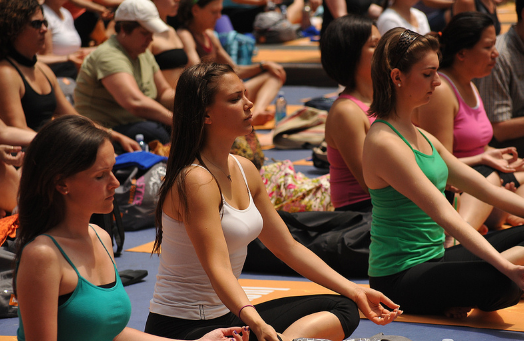 Doing Yoga and chanting with 200 like-minded Yogis could be a divine experience in itself. Imagine, what positive vibes we will create together! Each session is priced at only 4.50 euros (plus booking fee). The ticket gives you unlimited access to our stall area, and talks & sessions in Room C. You can stay for as long or as little as you like. If you want to attend more than one session, you are welcome to do that - you just need to buy more tickets. Everything can be booked online and you will be guaranteed a space in the class of your choice. We request you to bring your own mats. If you can't bring a Yoga mat, you can bring a Yoga towel as the surface is wooden. This class taught by a lovely Yoga teacher, Hannamari, will leave you buzzing happily throughout the day. Qigong has been called "Chinese Yoga", just as Yoga has been referred to as "Indian Qigong". Qigong can be considered as a combination of a number of Yoga (the science of self-realization) and Ayuerveda (the science of self-healing) practices. Both Yoga and Qigong are excellent for focused stretching, strengthening, and health maintenance. Qigong is the foundation of both Tai Chi and Kung Fu as well as being considered both part of and precursor to Traditional Chinese Medicine. This class combines the key principles of Qi Gong, Tai Chi, Kung Fu with Vinyasa Yoga to create an energizing Yoga flow practice that will improve both physical and mental well-being. Challenging Yoga poses, breathing, guided relaxation and meditation - this class has it all! This class is taught by UK-based Rach Cox, who has a decade-long experience in both Yoga and martial arts. She is coming all the way from Oxfordshire, England to teach at the festival. The Ashtanga method of asana practice originated in 1900s in the city of Mysore in India, and was developed by T. Krishnamacharya, who is considered as the father of modern Yoga.In Ashtanga Yoga, the order of asanas is entirely predefined, which distinguishes it from most other types of yoga. Ashtanga practice consists of four parts: Opening series, a main series, a back-bending sequence and a finishing sequence. This class is led by an experienced Ashtanga Yoga teacher, Tara, who is coming from the Netherlands to teach at the festival. She is going to teach a dynamic, strong class, going through the fundamental asanas of Primary series. Beginning by connecting with the ujayii breath, students will move through the key asanas of primary series – sun salutations, standing, balances, seated, hip-openers, back bends and finishing. Sweat stretch and feel goooood…. The Sanskrit word, ‘Bala’ means strength, so Balariddhi refers to “extraordinary strength of mind and body. There is no limit to what your body can achieve, if you put your mind to it. This class will focus on enhancing the core strength (bala).In this workshop, you will learn the right breathing technique, posture and props that are needed to stand on your elbows, head and hand. This class is led by a vegan Yoga teacher, Reg, who is coming from Ireland to show you how to use the strength in your body and mind to do challenging Yoga postures. You can expect a challenging power vinyasa Yoga flow with a few arm balances thrown in. Don't worry! Reg is an excellent teacher who will simplify the arm balances such as crow and handstands for you. He will teach you how you can prepare your mind and body to attempt the most difficult yoga poses with ease. Suitable for all- beginners and intermediate. On an emotional level, the root chakra is associated with grounding, vitality, and stability. But on a physical level, it regulates the lower part of the body – legs, inner thighs, hips and hamstrings. So, in this class, the Yoga guru, Tara, will help you open the blockages in the Muladhara chakra thus helping you develop flexibility in your legs. Keep following the practice and eventually you will be able to slide into full splits. This powerful workshop is led by experienced Ashtanga Yoga Teacher, Tara, who is coming all the way from the Netherlands to teach at Brussels Yoga and Vegan Festival. At age 42, she glided into splits for the very first time in her life. She is going to combine a dynamic strong Asthanga based sequence followed by yogic breathing and meditative yin style hip-opening stretches. Be ready to dive deeper inside. Beginners are welcome. This class is extremely beneficial for runners or if you are into any physical sports. If you struggle with too many racing thoughts and crave for calm, Yin Yoga is perfect for you. Yin is the stable, unmoving, hidden aspect of things; yang is the changing, moving, revealing aspect. In the body, the relatively stiff connective tissues (tendons, ligaments, fascia) are yin, while the more mobile and pliable muscles and blood are yang. Led by Yoga teacher, Annuka, the founder of one of the most popular Yin Yoga studios in Finland, this class will make you feel super relaxed. Chakra meditation is a form of meditation that consists of a set of relaxation techniques focused on bringing balance, relaxation and well-being to the chakras. “Chakra” is an ancient Sanskrit word that means vortex or wheel that can be traced back to India. In this class, the teacher, Rach, will teach you how to remove blockages of all 7 chakras and how to bring them in perfect harmony. The carefully selected postures in the class will warm the body, stretch and strengthen the muscles, lengthen the connective tissue (fascia) and encourage a balanced chi (energy) flow. The session led by an experienced Hatha Yoga teacher, Inari, will improve your energy and fitness while promoting relaxation and healing. What a wonderful combination! This Yoga sequence is unlike any other Yoga class. It is a series of twenty-six asana poses designed to scientifically warm and stretch muscles, ligaments, and tendons in the order in which they should be stretched. The practice of these twenty-six poses will enhance mind and body, relax, strengthen, reshape and heal all of you over time. As the body works to stay cool, the mind must focus in a challenging environment. As in all forms of yoga, hot yoga puts emphasis on deep breathing to increase the flow of prana or vital life. The breath connects the body to the mind and carries the practitioner through the poses. Deep breathing helps to calm the body and mind and circulates fresh oxygen throughout the body. Although in Hot Yoga class, the room temperature is usually turned up to 40 degrees Celsius, we will only heat the room up to 30 degrees Celsius for this class at the festival. Get ready to sweat it! The skin, the body’s largest organ, eliminates toxins through perspiration. The function of sweat is to cool the body through evaporation. Hot yoga practitioners purport that perspiration removes waste from the body on a surface level through the pores and on a deeper organic level by carrying waste away from the kidneys and liver. Sweating has also been found to stimulate the metabolism and immune system. Treat your mind, body and soul to this relaxing gentle yoga class. Taught by Yogi Tea, this class will include a sequence of very simple yoga poses done slowly, a guided sound meditation with singing bowls. This class is the perfect way to put yourself in a zen-line state and create a strong sense of inner peace. This class will focus on the anatomy of the spine and safe movement of the vertebral column. In this session, there will be Yoga postures that illustrate the four main functions of the spine and how to avoid stress in the vulnerable areas. This will also involve strengthening the core muscles that support the spine in its variable range of movement. The diverse set of postures in the sequence will work on all areas of your back. You'll learn how to stretch it, strengthen it, relieve lower back pain, and soothe your spine. This workshop will explore the best way to improve your back bend and explain how and why it works, and why, sometimes, it doesn’t. The workshop also includes pranayama and relaxation. This class will be taught by Kuldip, an experienced Kundalini teacher in Finland and United States. Suitable for all levels - beginners welcome.